If there’s one sign that’s outspoken, direct and will call things as they see them it’s Sagittarius. This is a sign that feels strongly that the truth must be expressed and if others have a difficulty with it, that is their problem. Aquarius and it’s ruling planet Uranus have an equal desire for freedom from the restraints of conventional morality. When Uranus has difficult aspects it would be inclined to say controversial things just for the shock value. Gemini is another sign that tends to say what it thinks, not so much because it’s a truth crusader, more because of an inability to keep quiet. So if you had a TV chat show in the 1970s and invited someone on with this combination even if he was relatively unknown, you might be expecting a more interesting programme than usual. Particularly if Pluto was just about to go over his Ascendant. In 1975, Billy Connolly’s was booked to appear on Britain’s premier TV talk show, the BBC’s Parkinson. Connolly made the most of the opportunity and told a joke about a man who had murdered his wife and buried her bottom-up so he’d have somewhere to park his bike. It was shocking, but also extremely funny and well told and Capricorn Research still remembers it 40 years later. Its impact on his career was staggering. Billy Connolly is a Sun Sagittarius, Moon in Gemini and his Sun is opposite Uranus. But on its own this combination might have just offended people and not improved his own standing so radically. Oppositions to Uranus can often have that effect. Connolly however has 3 planets that take the sting out of the opposition. They form what are called Easy Oppositions, where a planet is trine and sextile the two planets in opposition. Neptune is sextile his Sun and trine Uranus, but the more significant ones are Jupiter and Pluto both in Connolly’s 10th house of career. The fact that these two are trine his Sun shows the direction where the energy in the aspect with Uranus will naturally and easily flow, to make a sudden transformation ( Pluto ) and great expansion ( Jupiter ) of his career ( 10th house ). Pluto went over his Ascendant in 1976 and Connolly quickly became the most sought after comedian and a new kind of stand up comedy was born. 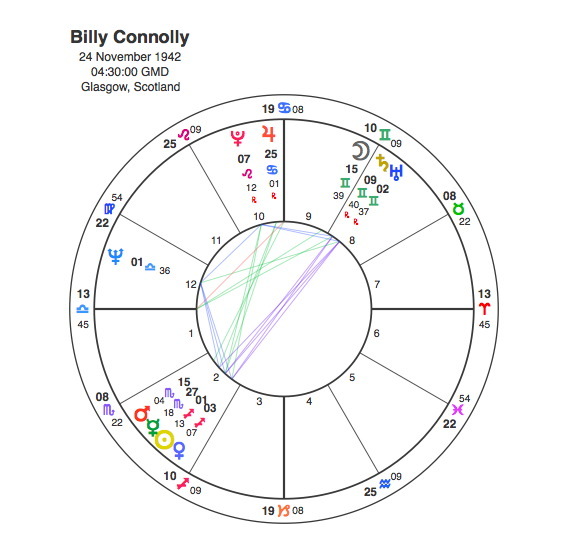 A big change occurred in Connolly’s career between 1995 and 97 when Pluto was conjunct his Sun and opposite Uranus as the emphasis moved from stand up to acting. In 1995, Connolly recorded a BBC special, entitled A Scot in the Arctic, in which he spends a week by himself in the Arctic Circle. He voiced Captain John Smith’s shipmate, Ben, in Disney’s animated film,Pocahontas. A year later, he appeared in Muppet Treasure Island as Billy Bones. In 1997, Connolly starred with Judi Dench in Mrs. Brown, in which he played John Brown, the favoured Scottish servant of Queen Victoria. He was nominated for a BAFTA Award and a BAFTA Scotland Award for Best Actor, as well as a Screen Actors Guild Award for Best Supporting Actor for his performance. Billy Connolly is a typical Sagittarian larger than life character, widely known by the name ‘ Big Yin ‘. For many years he was along with John Cleese widely held to be Britain’s favourite comedian, a sign that in some areas, size really does matter. Lost respect for Connolly when he made a joke about Ken Bigley’s execution. I suggest he does not show his face around Liverpool. Thats the trouble with having a big Sagittarian mouth, its easy to put any number of feet in it. I also have a big Sagittarian mouth and have often put my big fat foot in it…………….but even so and from a fellow Sag is a bridge to far?